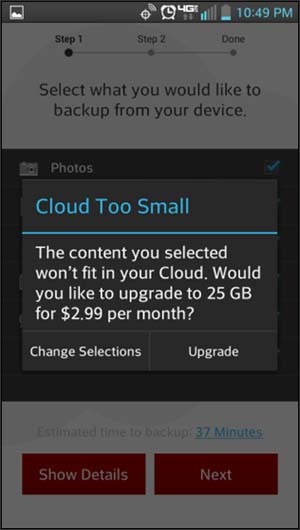 Having a memory card in the device may be required for Verizon Cloud to work. For best results, set up Verizon Cloud when the device has a good connection to the Verizon cellular network. 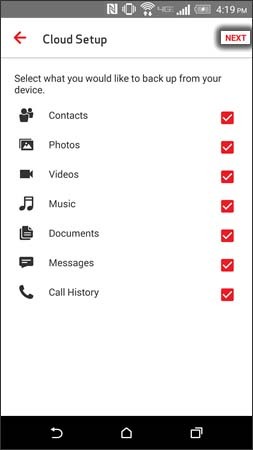 If necessary, select Verizon Cloud then tap Install (from the Google Play Store). If necessary, tap Accept (from the app permissions page). If the Cloud app doesn't open automatically, open it from the Apps list. Tap Next, then if presented, tap Allow to allow Cloud to access content on the phone. 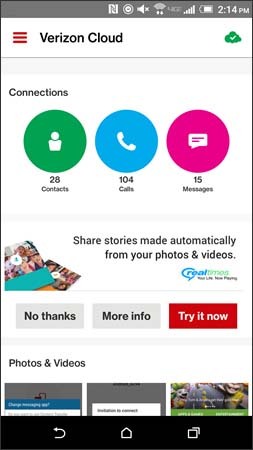 Depending on the Cloud app version, tap 'Set Up Verizon Cloud' or 'Get Started'. If prompted, enter the verizonwireless.com password for the device then tap Sign in. The phone number must be registered at verizonwireless.com. If prompted, enter the one-time PIN sent via email during first-time setup then tap Next. Select the desired option(s), then tap Next. If presented, select one of the following options, otherwise, skip to step 7. This option brings you back to step 6 to re-select what you would like to backup. Enter an email address then tap Next. 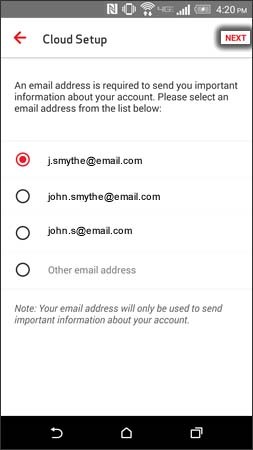 The same email address can be used with multiple phone numbers. Selected when a red dot appears next to the address. To review the enhancements pages, tap Next (located at the bottom) then tap Done. 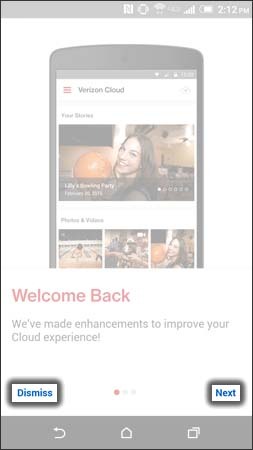 To skip the enhancement pages tap Dismiss. Tap anywhere on the screen to continue, then view the Verizon Cloud Home screen.